Every guitarist knows practice makes perfect but few are aware of the physical strain that practise puts on the body and the long term injuries that can accrue over a period of time through bad technique and poor positioning of the body. Repetitive strain injury is one of the most common injuries to affect musicians due to the repetitive nature of the occupation. Repetitive strain injury is caused by the inflammation of muscles and tendons due to repetitive movement and durations of holding the body in straining positions. The wrist and neck are the two areas most at risk to the guitarist, beginners are particularly susceptible as they tend to exert greater force on the instrument. Many factors in guitar playing contribute to bad posture resulting in neck and back injury, these include leaning over the instrument to see the fingers on the fretboard, low straps and low music stands. These are all easily rectified and can correct or prevent future back /neck problems. To help prevent injury to the wrist take regular breaks, practice a variety of music helping to prevent repetitive movement, increase practice time gradually and most importantly warm up before practicing. Warming up is extremely important to help avoid injury, improve technique and increase fluidity, with this in mind I have included some warm up exercises which are great for working alternate picking and improving dexterity and speed. 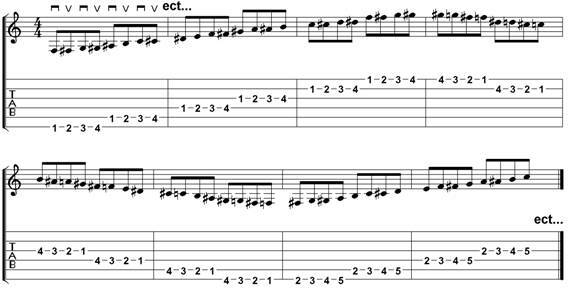 Start off playing the exercise slowly making sure to use alternate picking throughout. Ensure you use the tip of the finger to get the clearest tone. 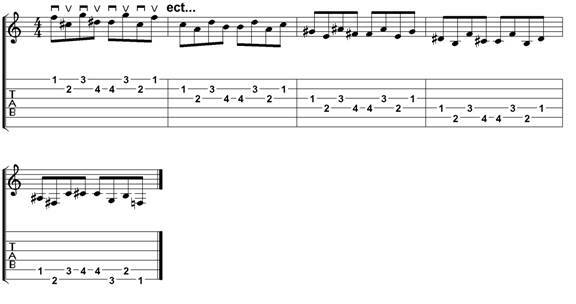 This exercise is based around the open e string start slowly ensuring that both the open and fretted notes are sounded cleanly. 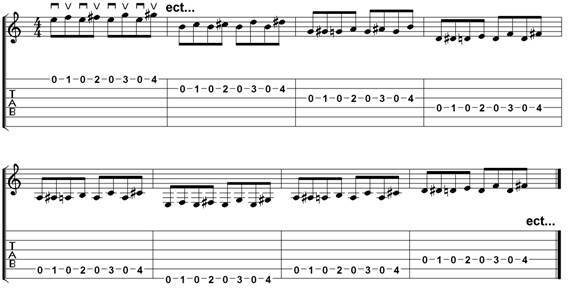 This exercise is great for improving co-ordination between the picking and fretting hand. The alternate picking can prove quite tricky so start off slowly. Playing scales is also a great way to warm up, below is a G major scale. Use a finger per fret throughout starting with your second finger third fret of the bottom E.
Below is an A minor scale, watch out for the finger shift on the G string. Both The G major and A minor scales are “˜transpositional’ meaning you can move the shape and play in different keys. The note you start on names the scale, for instance if you started the major scale on the 5th fret of the low E instead of the 3rd you would play A major, if you started on the 7th fret you would have B major and so on. Ensure that before starting to practice you spend five to ten minutes warming up that your music stand is at eye level and you have a straight back, you will thank me in a couple years!